This tutorial will guide you through creating a font directly from your own hand writing. Using the YourFonts.com (link opens in a new tab/window) service, you can create your own TrueType font in a matter of minutes. The steps are painfully easy. All you’ll need to do is download their .pdf template and print it, fill in the letters/symbols, then scan and upload it. You’ll be able to preview your font and make any adjustments before purchasing it. They charge a reasonable $7.50 to create the font for you, and it’s available to download immediately after purchase (plus it’s emailed to you). I’ve compared the YourFonts.com service to a number of other similar “font generators” and it’s both easier to use and less expensive. 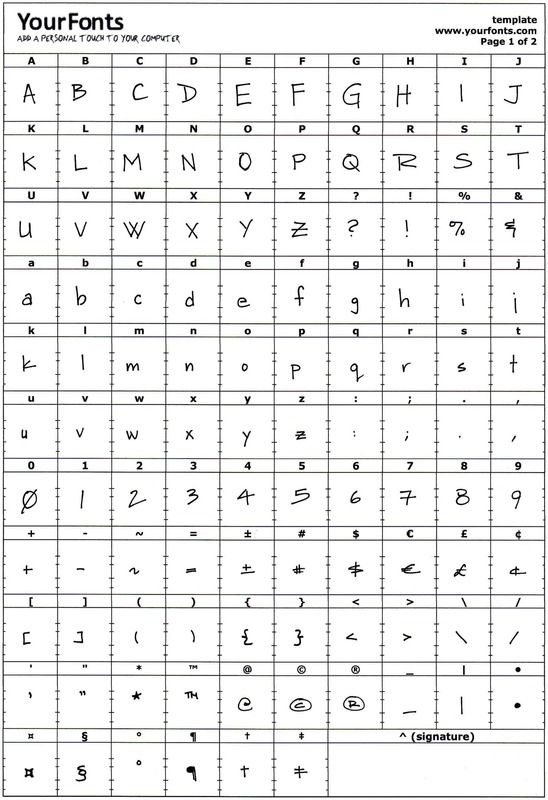 The template you use to create your font includes all of the letters of the alphabet, numbers, symbols and even your signature. Using your custom font is great for images for your website, editing PDFS, creating a signature for your emails, or even to use as the font for your IM conversations (though you’d be the one seeing it, unless both you and your chat buddy had the font installed). If you need help installing your newly created font, you can use this tutorial on how to install fonts in Windows Vista or XP or this tutorial on how to install fonts in OS X.
I know it’s heresy, but, it you have a Tablet PC (I know, BIG “if), you can do this using a free font tool from Microsoft here (http://download.microsoft.com/download/d/b/3/db3a39ab-58a4-4a7c-8f62-bf1e003cf18e/MyFontToolforTabletPCsetup.exe).